Since 1990, doctors have been regularly treating cancer patients using proton beams, which work similarly to radiation. Proton therapy is more precise, however, causing less harm to healthy surrounding tissues. Unfortunately, generating a proton beam requires a particle-accelerator facility that's the size of an airplane hangar and costs more than $100 million to build. Thus, proton-beam therapy remains a rarity, with only 37 working facilities worldwide, 10 of which are located in the U.S. Just 10,000 people were treated last year, less than 5 percent of suitable patients. Magnets in the kicker pull positively charged protons from hydrogen plasma made by a duoplasmatron. A deflecting magnet collects the stream into proton bundles, which then enter the injector, where a microwave field speeds the particles toward the acceleration chamber at up to five million mph. At nearly the same time, a laser fires a light pulse, which splits into fiber-optic cables of various lengths. As a bundle of protons enters the acceleration chamber, a light pulse hits the chamber's first pair of electric lines, triggering the release of electrons. The resulting electromagnetic field propels the proton bundle forward. The light pulse triggers the electric lines in a wave, sequentially accelerating the proton bundle until it's traveling at 335 million mph-or about half the speed of light. The entire process is controlled by a clock, which directs magnets to turn on or off and the laser to fire. Moving a patient is easier than moving a 13-foot-long particle accelerator. 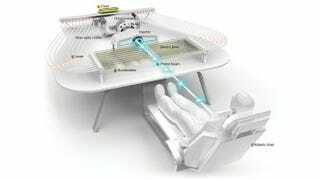 A robotic chair maneuvers a strapped-in patient in front of the proton beam to target a tumor from different angles.